The wolf, representing fearsome strength and doom, was one of the most potent symbols in the Viking world. Deep set in mythology and mysticism, The wolf and Norse mythology remained at the core of the developmental process. 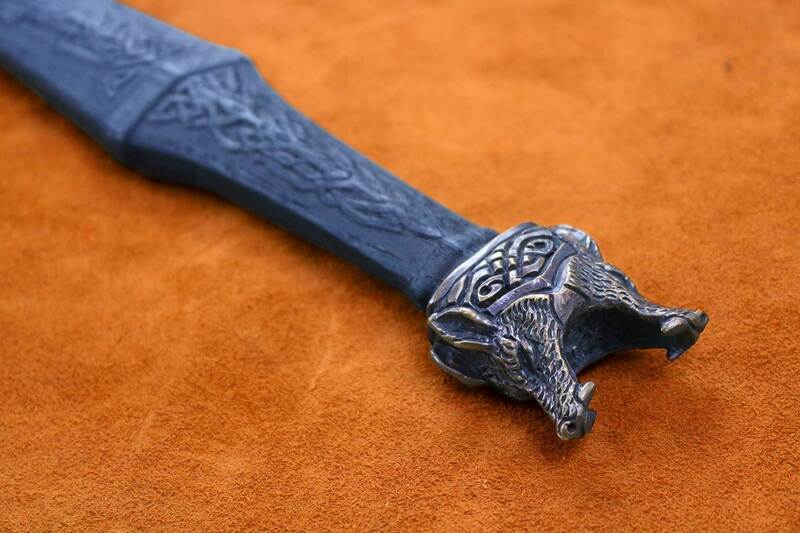 Aggregating all essential elements of Viking life, artistry and Norse Mythology, the Wolfsbane Viking Sword exemplifies the peak of Viking culture amalgamated with modern imagination. The mythological symbol of the wolf is balanced by mirroring self images. 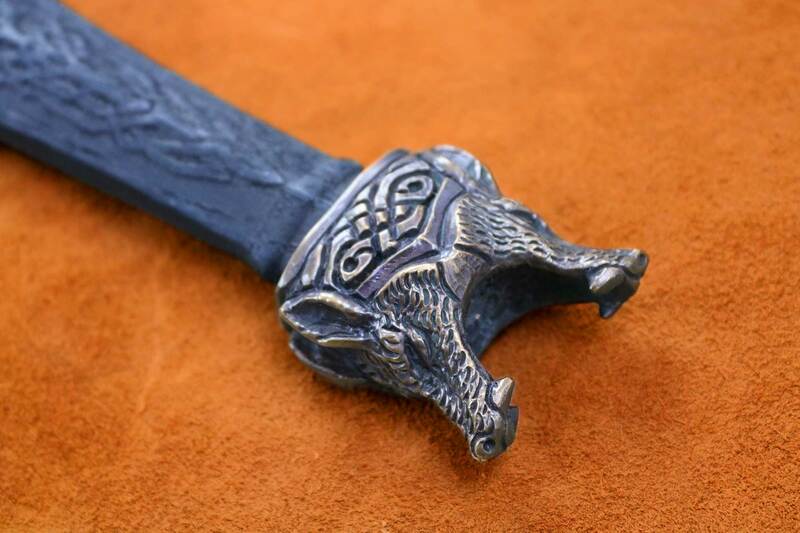 Carefully cast solid bronze fittings and a carved oak handle, The Norse Wolf, as a steward of Viking culture and Mythology, is at the core of this Viking sword. As Norsemen invaded, burned and plundered foreign shores, legends and mythology were born. Doomed gods walked among men, gathering their strength for the final battle at the end of the world. It is little wonder that when our imagination takes us into the most gripping realms of fantasy, we cannot help but turn to the myths and legends of the North. The wolf was one of the most potent symbols of the Norse mythology. It represented fearsome strength and doom. A symbol of royalty and power across the Nordic world. Aggregating all essential elements of Viking life, artistry and Norse Mythology, the Wolfsbane exemplifies the peak of Viking culture amalgamated with modern imagination.The mythological symbol of the wolf is balanced by mirroring self images. 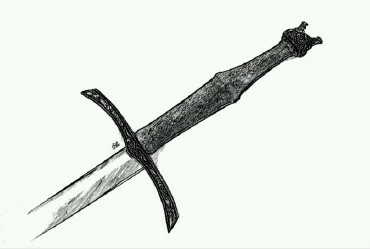 Meticulously crafted fittings and handle, The Norse Wolf, as a steward of Viking culture and Mythology, is at the core of this Viking sword. The Fenris Wolf, offspring of Loki and Angrboda, destined to kill Odin rests on the solid bronze guard. Its fetters are worked into knotwork inspired by the Jelling Stone. The Fenris Wolf’s head snarls on the pommel, while on the handle, the wolves Geri and Freki, the loyal companions of Odin who hunger for the bodies of the slain in battle, lay intertwined. Amalgamating modern romanticism of Norse folklore and excavated Viking swords of great importance, the Wolfsbane is a beautifully crafted testament to the arts, culture and beliefs of the Viking people. 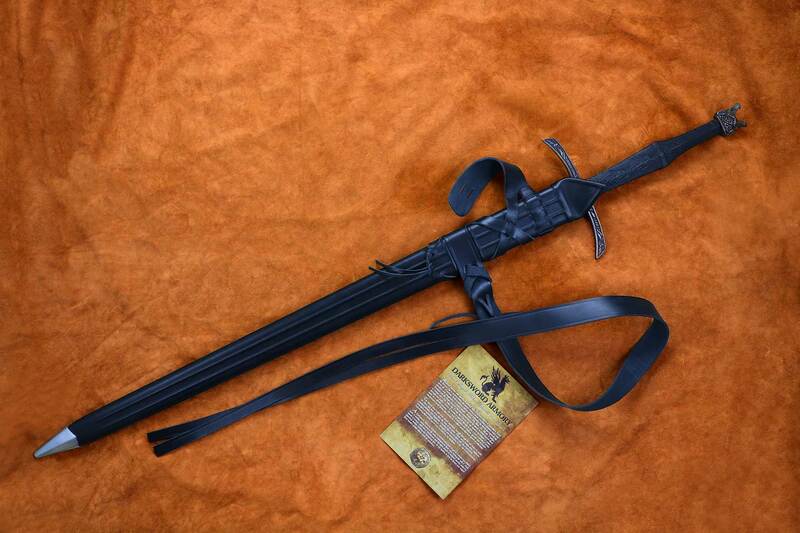 Luxuriously handcrafted from the finest material, the Wolfsbane sword is a distinguished Viking weapon catering to the most discriminating collector. Richly detailed solid bronze guard and pommel, Painstakingly crafted Red Oak handle; the Wolfsbane is a heirloom quality piece reminiscent of the migration age. Sharp and well balanced, well made craftsmanship makes for a perfect swing for those with the strength to wield it. as good, to stand in his stead. It is difficult in this modern world, with our cars and guns and indoor plumbing, to truly grasp the incredible danger that wolves once presented to humans – but if you took away our modern technology and turned us loose in the wild, we would quickly come to appreciate the incredible danger we face. Creatures of lithe grace, keen intelligence, and surpassing deadliness, wolves are pack animals whose ability to work together makes them a threat even to human beings. To ancient cultures they represented a fearsome quality, an aspect of nature that was decidedly unfriendly towards humanity. Their intelligence must have seemed uncanny, even sinister – which is why in Viking culture they feature so prominently as creatures of evil. The great wolf Fenrir is the clearest example as a force of malevolence in the Viking world, prophesied to be the slayer of Odin Allfather. According to numerous surviving sources from the Viking era, Fenrir is one of the offspring of the trickster god Loki and the giantess Angrboða (along with the serpent Jörmungandr and goddess of death Hel). When Fenrir was still young the gods knew that he would cause much harm and attempted to trick him into being bound for all time. Twice the fashioned great iron bonds to hold him (purporting to be “testing his strength”); however, Fenrir was too powerful, and the first two attempts failed. For their third attempt they asked the Svartálfar (dwarves) to make them an unbreakable chain – Fenrir was by now suspicious, though, and refused to test this new chain without a show of good faith from the gods. Alone, of all the Norse pantheon, the god Try showed bravery, and placed his hand inside Fenrir’s mouth. The dwarven bond held, and Fenrir was bound – though at the cost of the god Try’s hand – and according to prophecy will remain so until the battle of Ragnarok when he will defeat Odin. Fenrir is also the father of the race of Wargs; fearsome giant wolves including Sköll and Háti who are destined to join Fenrir during Ragnarok and devour the sun and the moon. Wolves also feature prominently in the HBO series “Game of Thrones,” though in an entirely different way. House Stark, one of the Great Houses of Westeros, holds dominion over a vast land known as the North and the Vale. Members of House Stark were once Kings over that land, though later became a part of a greater nation as Nobles. The symbol of House Stark is the fearsome Direwolf, a “scaled up” version of one of our Earth’s wolves. Several members of House Stark (including the illegitimate child Jon Snow) actually take Direwolves as companions, some even bonding to them psychically. These Direwolves are fearsome yet noble creatures, acting in the best interests of the human they have become bonded to. Their relationship with House Stark is so important that when Jon Snow was given a sword of special Valyrian steel, the pommel of the sword was made into a wolf’s head. 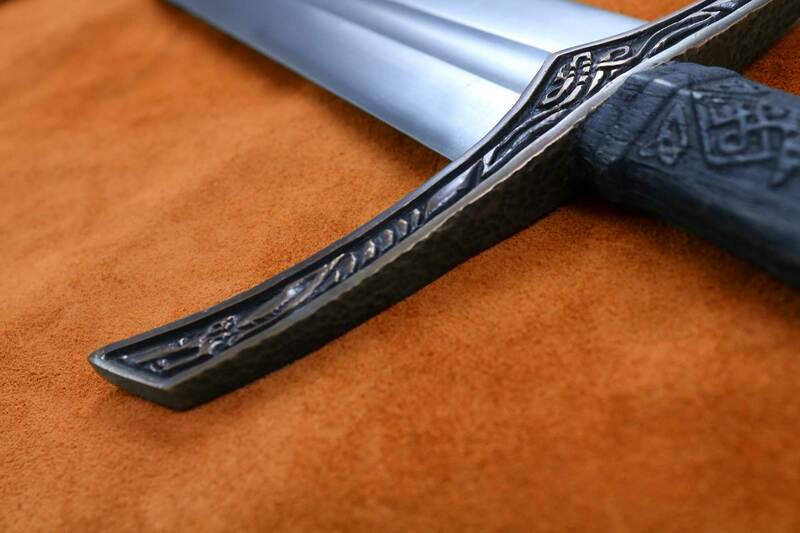 This sword – “Longclaw” – is Jon Snow’s signature weapon and as recognizable in our modern pop culture as any other sword in movies or on television. We at Darksword Armory are fans of Game of Thrones and Viking culture, and the Wolfsbane was born out of a deep appreciation for both. Blending a mix of Viking culture and a touch of House Stark, we wanted to create a sword reflecting the feel and theme of our favourite TV series, while preserving a sense of history. We set out to use both Norse elements and Game of thrones ‘feel’ to create a sword that was not only historically plausible, but also enriched with Viking mythology and a ‘heroic’ feel. to Achieve this, extensive research on viking art and scroll work was undertaken in written sources and museums. Using historical references, we designed the Wolfsbane's guard to reflect both Norse mythology, art and culture. The mythological symbol of the wolf is balanced by mirroring self-images on both pommel and guard. Expertly designed knotwork binds the wolf designs together. Once designed, a prototype is engraved on a max master, and prepared for casting (shown left) using the 'lost wax' process, also known as investment casting, or precision casting. During this process, wax 'copies' of the guard and pommel is placed in a cylinder and covered in plaster. The plaster covers the entire surface of the fittings and molten bronze is then poured into the mold (plaster canister holding the wax fittings) as shown on the right. 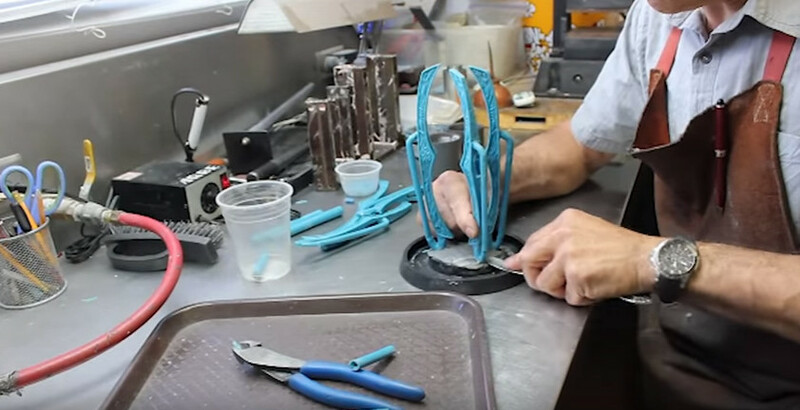 Once the mold is made, the wax guard is melted and drained away as the bronze pours into the mold, thereby melting the wax and taking the shape of the prototype in the plaster. Lost wax is also used in other applications such as statue making and sculpture reproduction. The blades for the Wolfsbane swords are forged with 5160 High Carbon steel and differential hardened at a Rockwell of 60 at the Edge and 48-50 at the core. This gives flexibility to the blade, therefore making the swords more durable, while keeping the edge sharpness at an optimum level. While forging, the blade is made by a 2 x 40 5160 flat bar and 'drawn' to the desired shape. 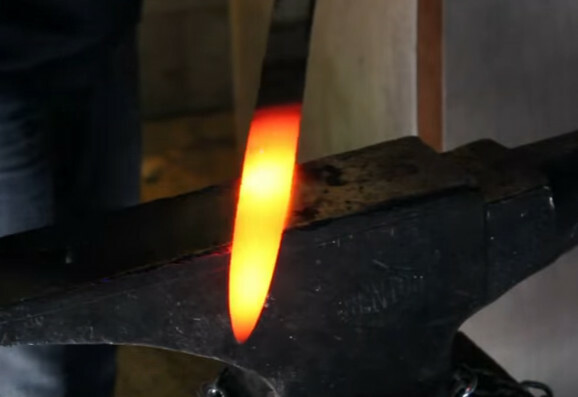 While forging, we use heat to bring a 5160 flat bar to a malleable state in order to "draw" (hammer to shape) the blade of the sword. Once the desired shape has been achieved, the steel is normalized; a process in which the blade is evenly heated and then allowed to cool gradually. The normalizing process removes any stress built up caused by heating and hammering of the blade. These "stresses" generally account for blade failure. 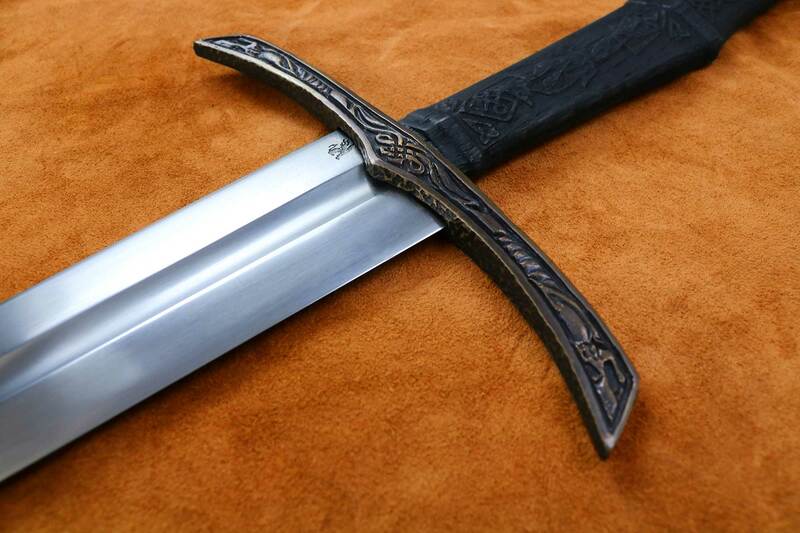 Hence it is important to properly normalize a blade prior to Quenching and tempering a sword's blade. While normalizing removes stress caused by the forging process, quenching (the rapid cooling of the blade) hardens the steel by changing its properties (from Pearlite to Martensite). The quenching affects the atomic structure of the steel by "freezing" the carbon that can freely migrate while the steel is hot. While quenching gives the blade better edge properties, it also makes the steel very brittle (too hard). 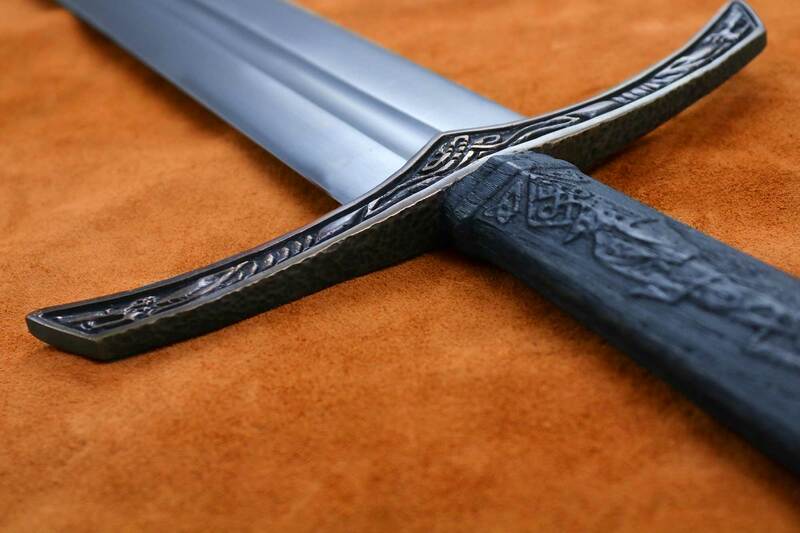 To counter the brittleness and restore ductility and durability, the sword blade is then tempered; a heat treating process, used to increase the toughness of the blade. The purpose is to create a balance between toughness, hardness and flexibility. 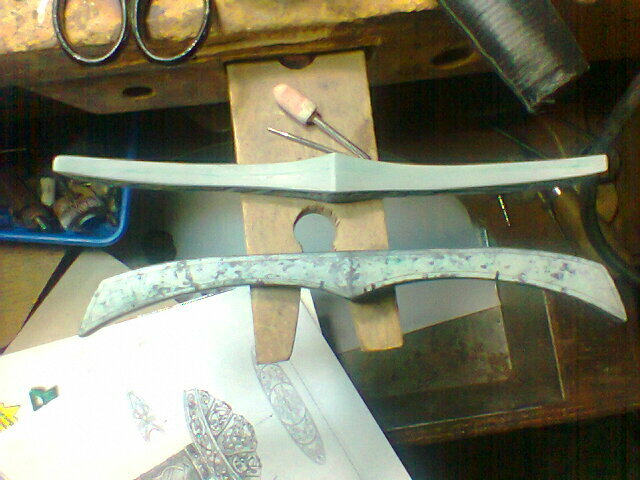 After cooling and polishing of the blade, the sword is assembled. 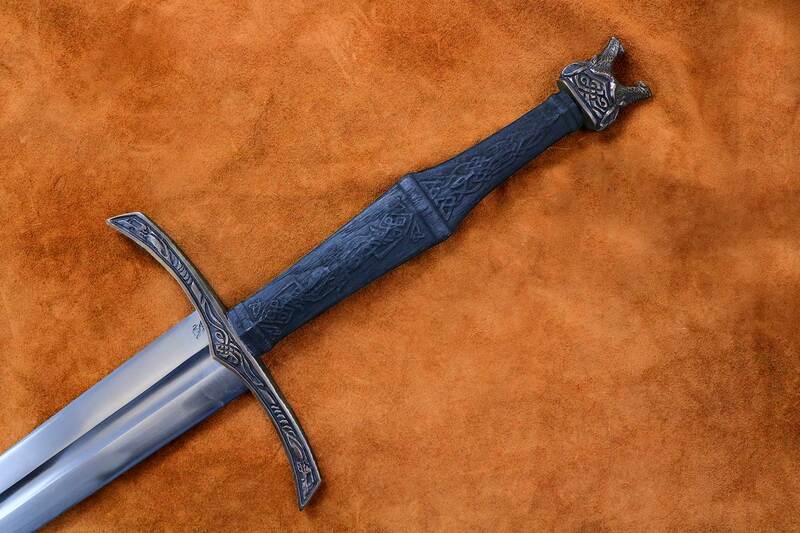 The blade is fitted with the guard, pommel and grip. The point of balance (POB) is carefully determined by the dynamics between the geometry and weight of he pommel and that of the blade. 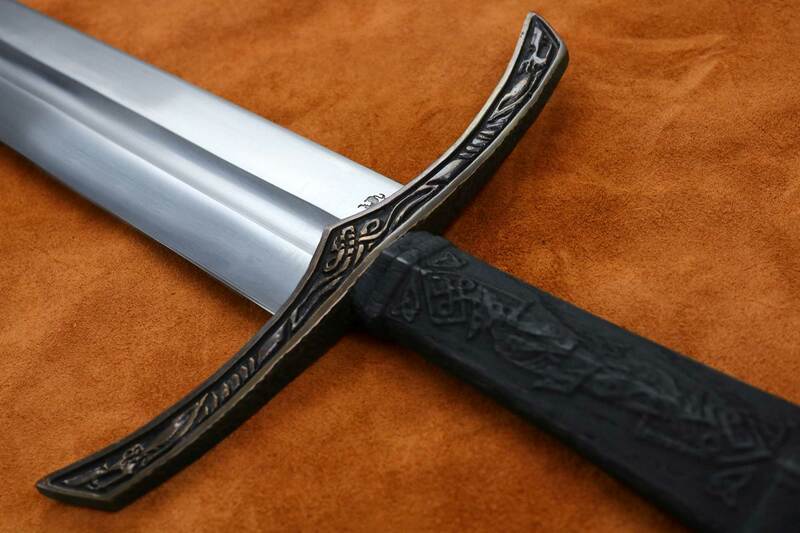 while the quality of the steel is essential to the medieval sword, the quench, tempering tang construction and geometry and POB are all precision aspects that combine the harmonic balance of the sword. 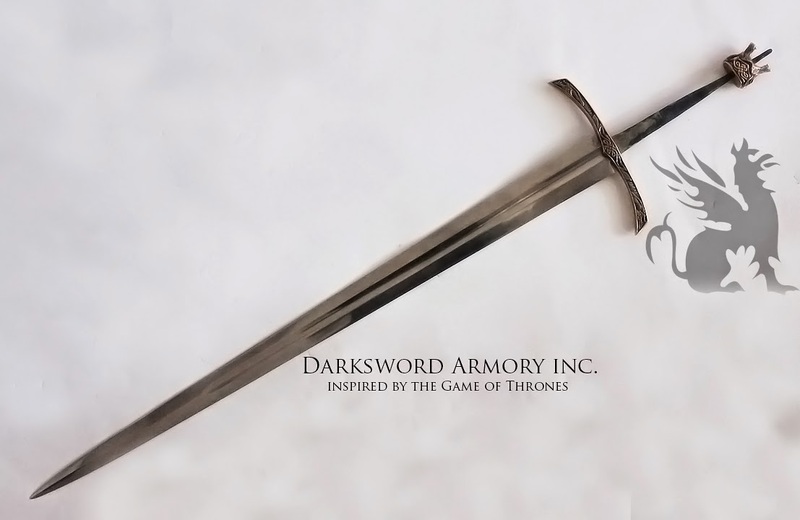 While we at Darksword Armory attempt to give our all when we design each new sword, it is safe to say that the Wolfsbane holds a special place in our hearts. 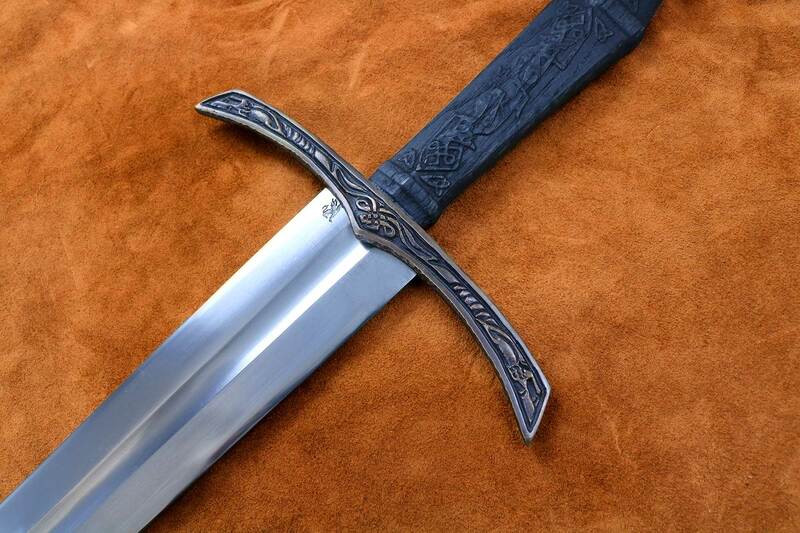 Meticulously crafted fittings and handle, the Norse Wolf, as a staple of Viking culture and mythology, is at the core of this Viking sword. At the same time, we intended it to evoke in fellow Game of Thrones fans a feeling of grandeur and adventure, as though they too stood with Jon Snow with the Night’s Watch to defend Westeros. Finally, we hope that the spirit of the wolf – a creature that, while deadly, has come to represent ideals of family, nobility, and courage throughout human history and across many cultural boundaries – will go with this sword and protect you and your loved ones."